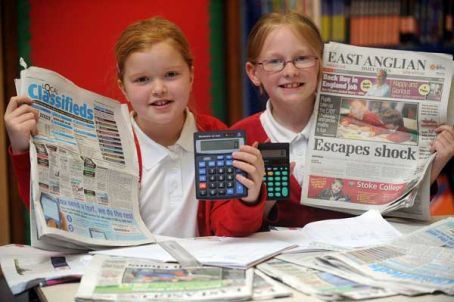 A project by two regional dailies to help school children improve their maths has beaten off competition from around the world to win a media award. The East Anglian Daily Times and the Ipswich Star won the PR and Community Service category at the World Congress of the International News Media Association, which was held in New York. The Archant titles won the prize for their Maths Challenge project which was launched last year, in partnership with Suffolk County Council, in response to poor attainment levels in maths. Around 7,000 pupils from more than 120 primary schools took part in the scheme, which saw them use workbooks to complete maths tasks using stories from the newspapers. Two of the pupils who took part in the challenge. The awards attracted 500 entries from 30 countries around the world. Editor Terry Hunt said: “I am absolutely bowled over by this award. It’s a great tribute to everyone who worked so hard to get Maths Challenge off the ground in response to a problem, including the teachers who produced a brilliant workbook, all the schools who took part so enthusiastically, and, of course, all the children who took up the challenge. “It’s also a good example of the contribution that a good local newspaper can, and should, make to its community. The project was so successful that it is being repeated this year.